There’s a lot to be said for the color wheel. It teaches us so many things related to color – which ones are complementary, which ones are best suited for contrast, cool and warm hues, etc. And speaking of contrast, we just love it when two opposite colors come together, as they do in this classic dining room. 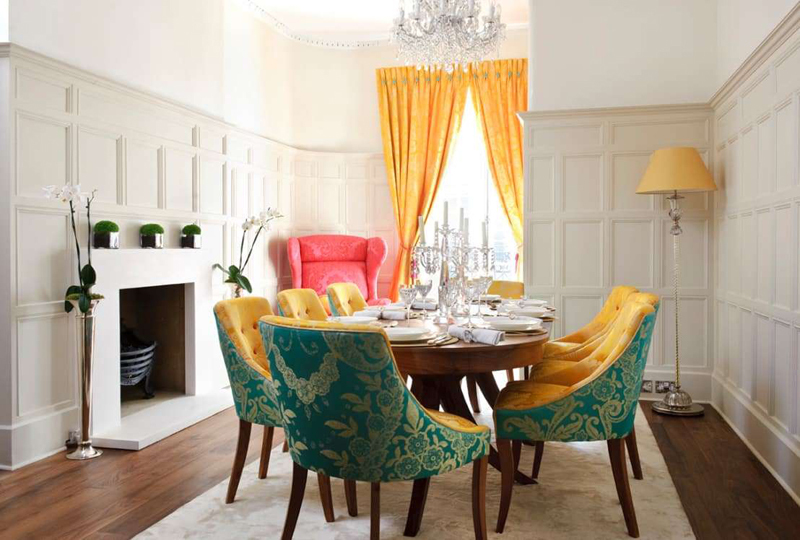 Sunflower yellow and teal blue ensure a striking effect for the dining chairs, and a dash of rouge in the background lights up the armchair while also complementing the cheery yellow of the window treatment. There’s no reason why your dining room walls need to be completely white. Or even a slight off-white. 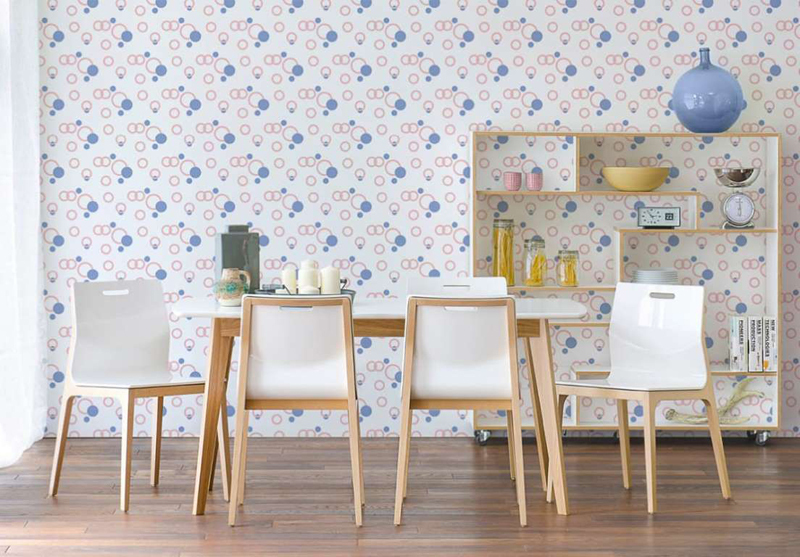 Instead of a blank and dull background, add a bit of excitement via wonderful wallpaper.If done correctly and stylishly (as in this example), your dining table and –chairs can be left quite subtle and minimalistic without looking the tiniest bit dull. Notice how the accessories on the bookcase complement the hues of the patterned wallpaper. Now that’s smart interior design! 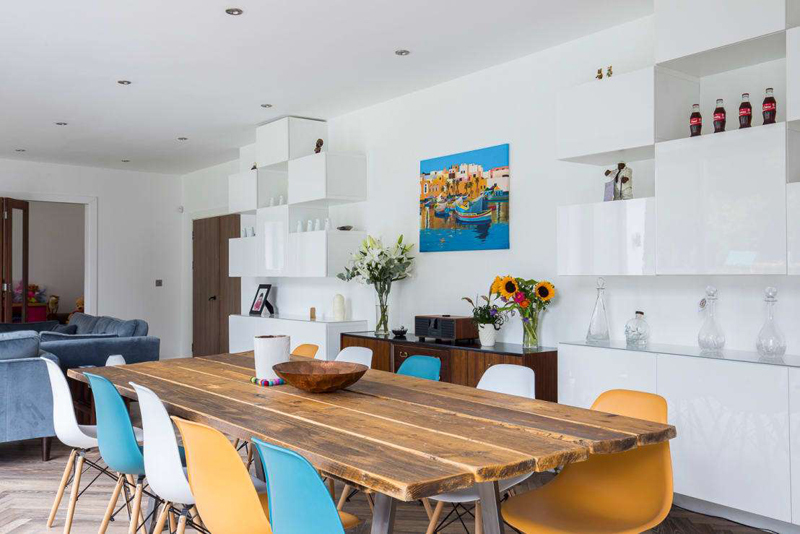 Even though modern style dictates a love for open-plan layouts, we still have quite a few options to ensure those various spaces (such as the kitchen, living room and dining area) don’t blend in too well with one another and end up getting lost. And color is the easiest and most fun!Staying with a neutral backdrop throughout, this open-plan dining area opted for warm autumn tones to give itself a welcoming, enticing look. 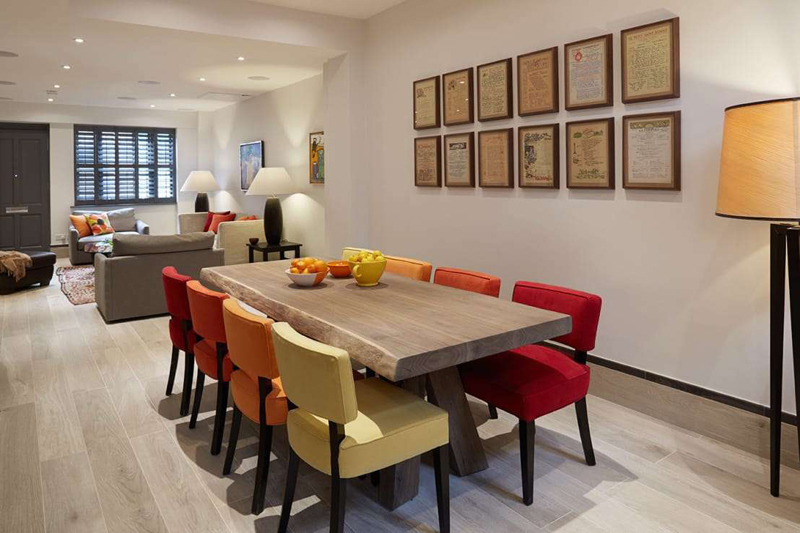 Cherry red, marigold orange and daffodil yellow not only complement one another, but also fit in superbly with the earth tones of the wooden dining table. Why not let nature provide colors for your dining room? With big windows and glass doors, garden views can come flooding indoors, treating your interior spaces to a host of fresh greens and pops of cheerful tones (depending, of course, on what you’ve got going on in your garden). This modern dining room didn’t want to take any chances and opted for a handful of colorful pops in the Scandinavian dining chairs to complement the fresh greens of the lawn. Who says we’re only restricted to solid colors? That’s the beauty of patterns and motifs! Depending on your dining room’s style, there’s a multitude of patterns you can use to give your dining room not only some color, but character as well.This dining corner may be tiny, yet it is the way it flaunts those motifs in baby blues, rose pinks, pear greens and tiger oranges that makes it an exceptional design. Color psychology teaches us that every color under the sun has a specific meaning. 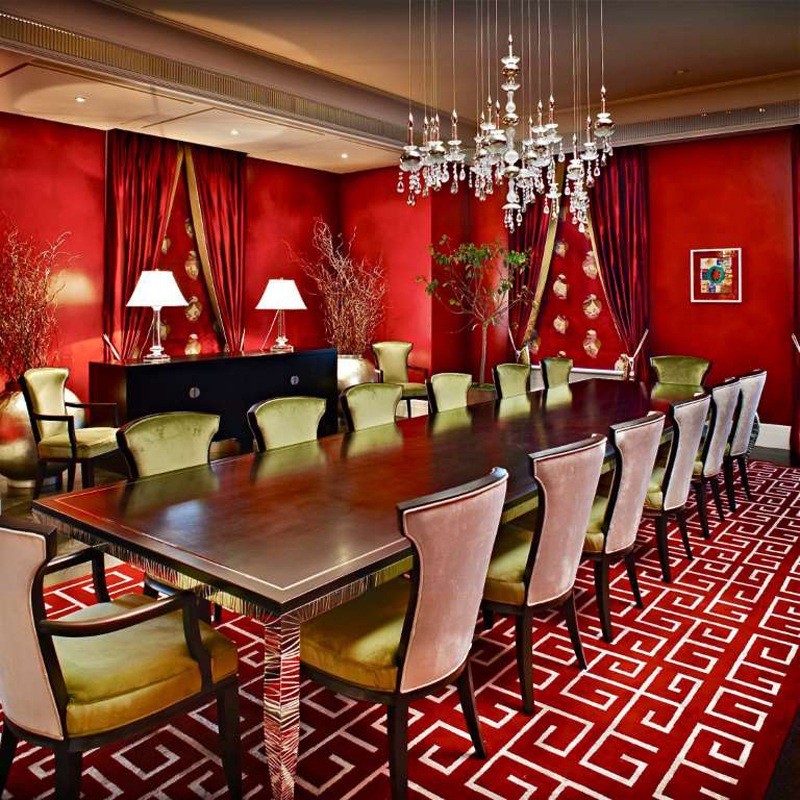 And although red can signify danger in some cases, this classic dining room opted for a royal and lavish look with its bold reds. Yes, one can opt to use only a dash of red in an otherwise neutral dining room (say, red upholstered chairs, for instance). But if you’re brave enough to go all out with your hot color palette, why not opt for something striking such as this? 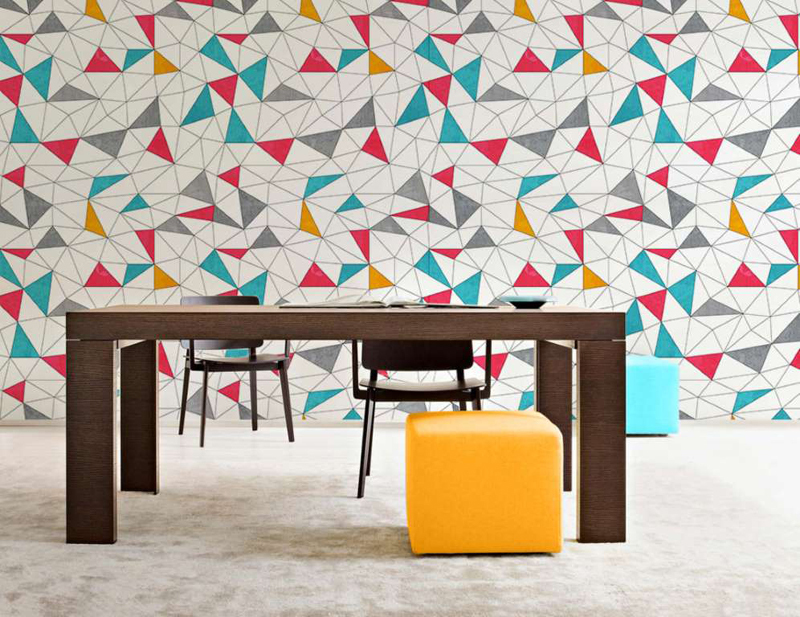 Color can be flaunted in many different ways, so don’t discount the surface that you’re walking on. Rugs and carpets is another opportunity for your dining room (regardless of its style or size) to flaunt a few tints.We especially love how this modern space uses the soft blues of the rug to complement the electric blue of the dining chairs. And how these cool hues offset with the warmer yellows of the living room in the background. Blue is the one primary color that can pretty much work in any space, given its multitude of different hues that can go from cheery and playful to classically elegant in an instant. 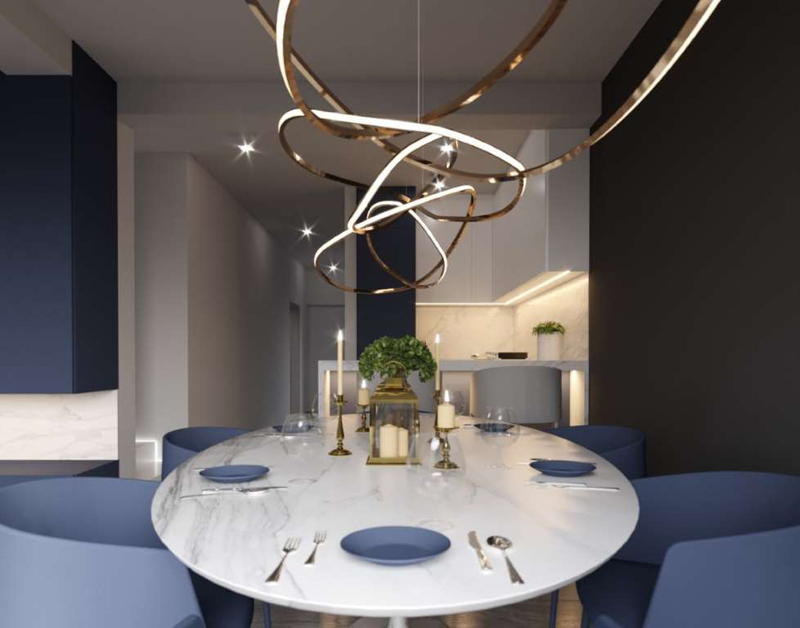 See how this grey-blue tint not only provides a luxurious look for this contemporary dining room, but also works with the golds and off-whites that color in the rest of the room. But since blue can be a pretty cold color, how does one go about using it correctly in the dining room (a space where ‘cold’ is the last look you want for your dinner parties)? Start by using it in smaller quantities, like perhaps a beautiful vase for the table’s centerpiece, or striking china which brings color to the room. Once you’re sure about the shade of blue you’ve chosen and you wish to add more, then start looking at rugs, lighting fixtures, chair covers, etc. Of course it’s not only the color of your dining chairs that matters, but also their shapes. And we especially love these brightly colored ottomans that ensure a fresh touch for this dining room. But see how those yellows and blues of the ottomans are repeated in the wallpaper, even though the hues are not 100% identical? 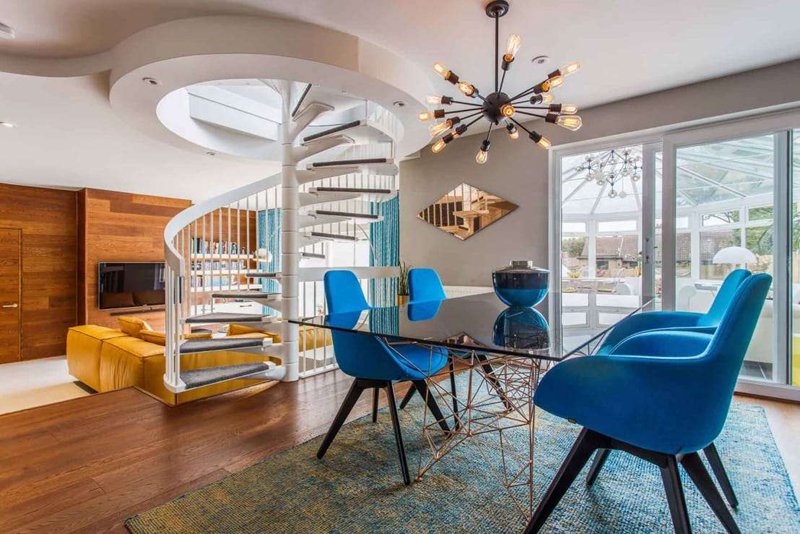 Complementing colors are important, as they help to establish a visual link that makes the entire room’s design flow. Let your décor pieces help complement your dining room's color palette. This striking baby blue is balanced perfectly in the Scandinavian chairs and wall art (and look how those soft oranges are repeated in the sunflowers), ensuring a design which flows effectively from one side of the room to the other.Struggling to make your dining room’s look work? It could be the table. 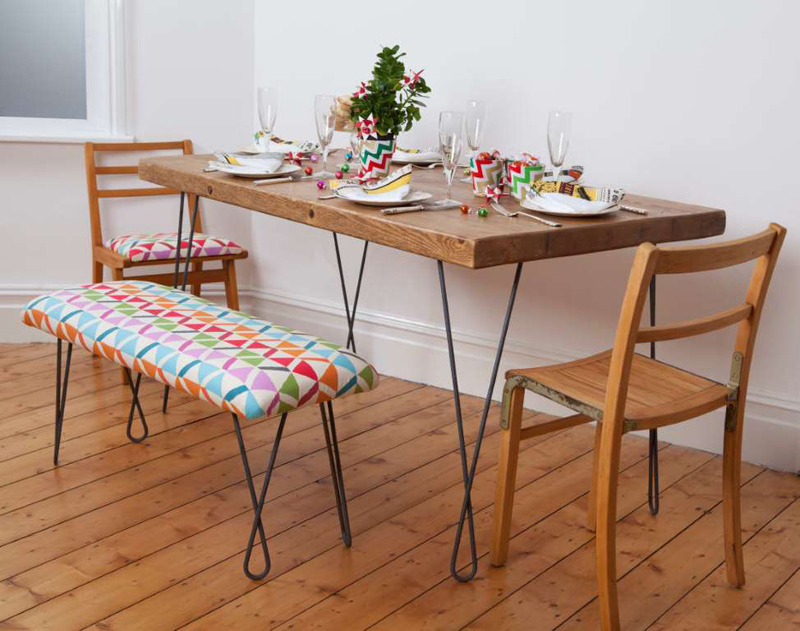 Let’s fix it with Dining tables: Round or rectangular?